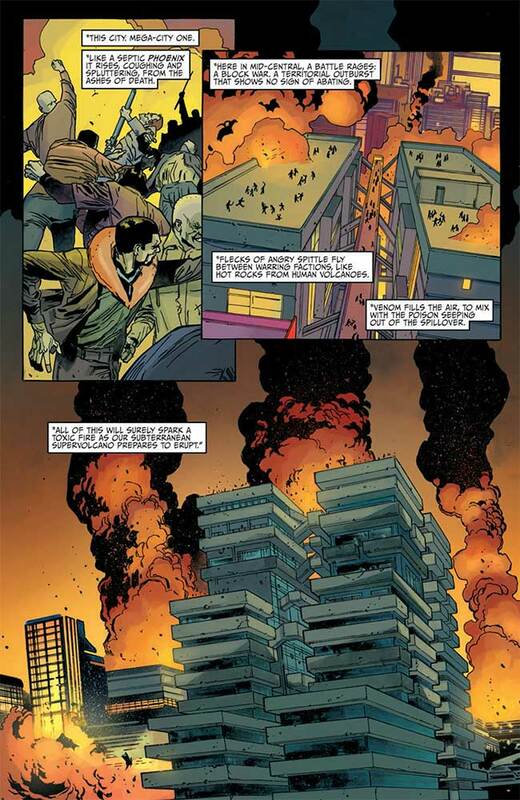 And a block war it is in the Mid-Central area of Mega-City One, atop ‘a subterranean supervolacano ready to erupt.‘ Those above ground really have no idea what’s happening in the sewers beneath them or how their lives are in legitimate danger because of it. Transportation is shut down, pumice spits up from below and the Judges try to contain the situation before it inevitably gets worse. Ordinance workers do what they can to clean up the skies, hoping to give the populace clean air to breath, but it’s a lost cause and the expected rain due to arrive soon will bring acid down on the city, making a terrible situation so much worse. 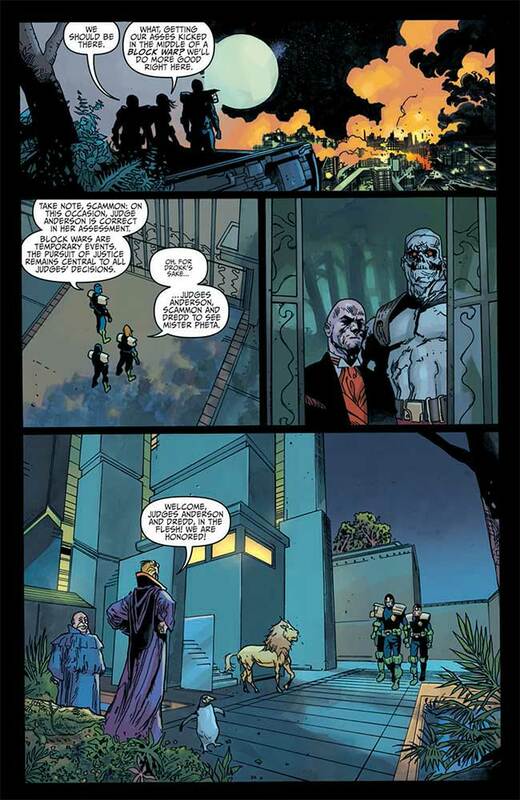 Outside the block war, Judges Dredd, Anderson and Scammon meet with the mysterious Mr. Pheta, the ‘body modifier to the stars.’ They’re hoping he can provide them information on the whereabouts of the offworlders needed to set all of this right again – and it just so happens that he does. As they head down to his lab, Pheta explains to Dredd how everything is on the up and up with his business… for the most part. Before Pheta can give Dredd some much needed info, he’s shot dead by some men in a truck. 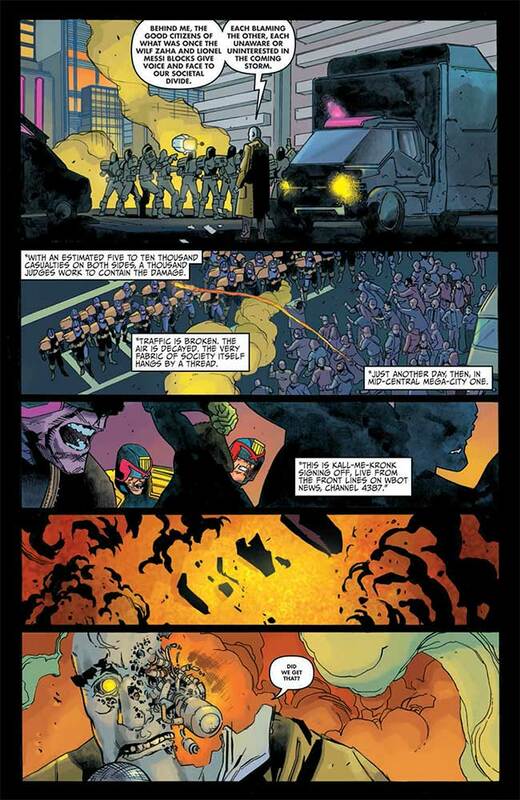 Dredd and Anderson commandeer a cab and follow, eventually catching up with and taking care of the assassins. From there, they head back to the lab to examine the ‘blender’ specimens obtained from Pheta’s workshop. Here, Anderson scans them and learns what they do and how they do it, and how they’re key to life in many ways the average human just won’t understand – and that there are more of them alive in the Spillover. 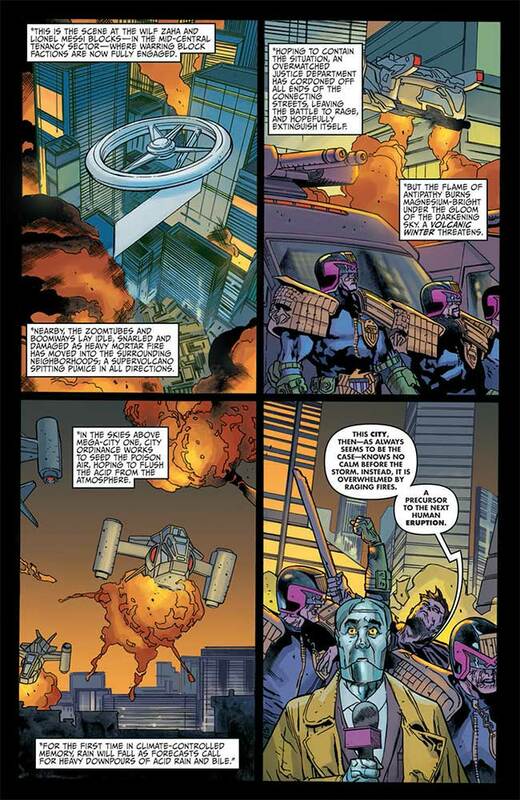 As Dredd, Scammon and Anderson (with some help from the Blenders) prepare to go seven hundred meters into the bowels of the city, Spencer Richards, the leader of the Anti-Alien League, goes on television to speak out against the ‘fake media’ and fear monger by waving a gun around. Sigh. This one hits a little too close to home at times. Jenkins’ script is clever and poignant, taking some well-deserved pot shots at the current occupier of the Oval Office’s tendency to manufacture crisis and use fear and hatred as a political tool. He works this into a tense and engaging story, of course, but it does serve as a depressing reminder of how a certain faction of modern American politics can and does use anti-immigrant rhetoric for political and financial gain. When the human element is meaningless to those with power, it’s not so hard to see this story not so much as a work of politically satirical sci-fi/action but as a warning sign. Now that I’m off the soapbox, however, as far as the entertainment factor is concerned, this is a fun read. 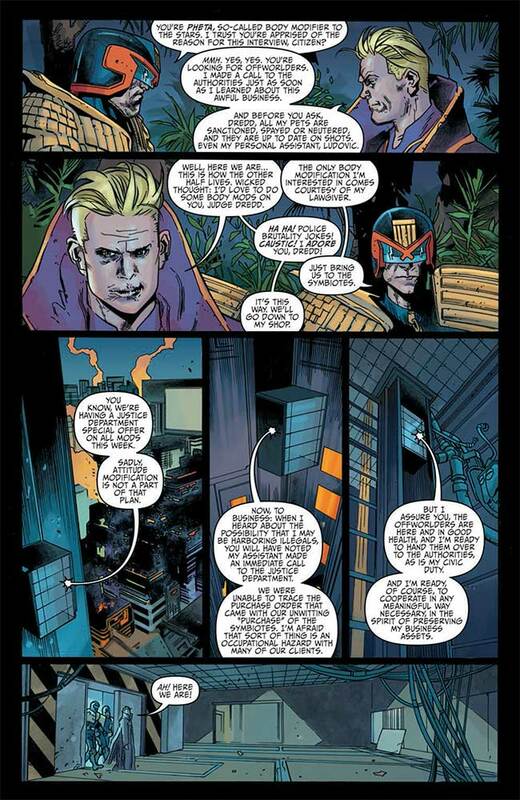 The humor inherent in the best Dredd stories is here and the script builds tension nicely. 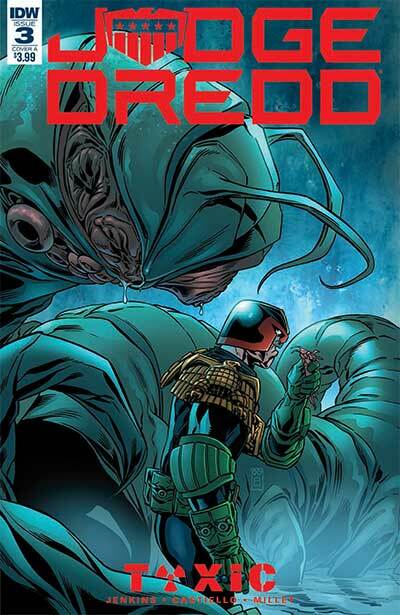 The dialogue, the back and forth, between Dredd, Scammon and Anderson is genuinely funny in spots while the mystery behind what’s really happened to the Blenders keeps us engaged in where all of this is headed. The book is well-written. Marco Castiello, co-inker Vincenzo Acunzo and colorist Jason Millet do a nice job on the artwork. While Dredd could look a little surlier than he does here, his trademark scowl is here and there’s nice detail in the backgrounds of pretty much every panel. The colors are well-done, really bringing home the sickness of the interiors of the sewers and doing a nice job of bringing the explosions in the block war panels to life. Characters ‘move’ well and there’s a good flow to the way that all of this is laid out. With one issue left, the big finish is only a month away – and, as you might guess, this issue ends on a pretty big cliffhanger, meaning that if you’ve enjoyed the story line this far, you’re going to want to grab the fourth and final chapter to see how it ends. So far, this series (like most of IDW’s Dredd books) has been rock solid. Oh, and it’s nice to see a full page memorial to the late, great Carlos Ezquerra in the back pages of this issue. Clearly, without him, this book wouldn’t be here and it’s a fitting tribute to an important artist.